IEEE/ASME Transactions on Mechatronics, (In press) , 2018.
for individual activation of bending actuators. The legs were designed so that the first two resonance modes overlap and therefore produce a walking motion at resonance. 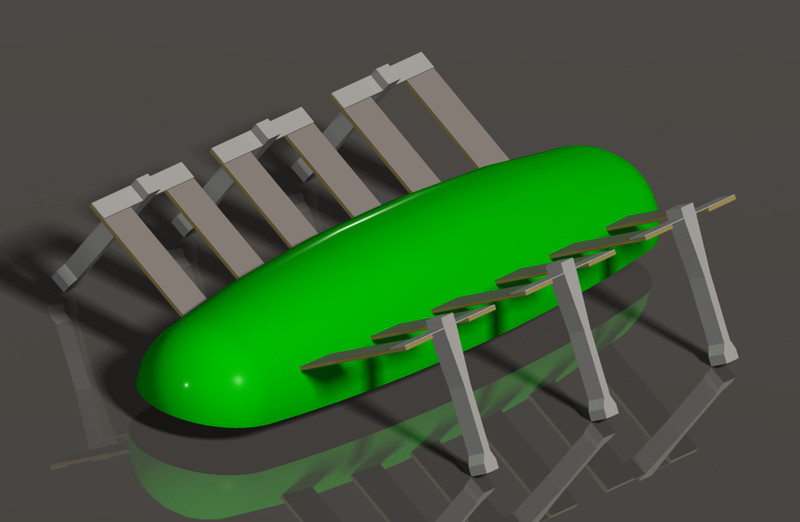 The monolithic construction significantly improves the matching of resonance modes between legs when compared to previous designs. 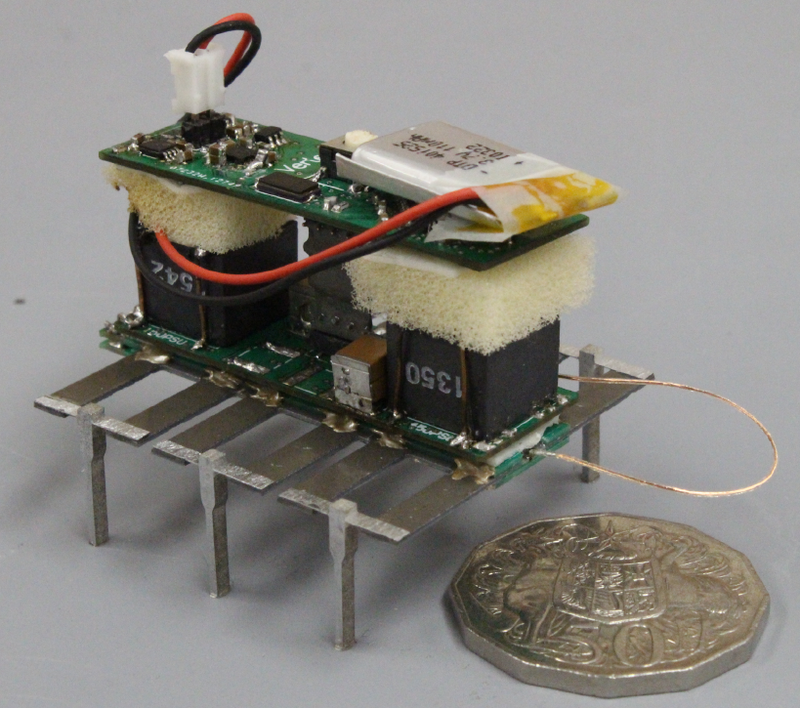 Miniature control and high voltage driving electronics were designed to drive 24 separate piezoelectric elements powered from a single 3.7 V lithium polymer battery. The robot was driven both tethered and untethered and was able to achieve a maximum forward velocity of 98 mm/s when driven at 190 Hz and 6 mm/s at 5 Hz untethered. The robot is capable of a wide range of movements including banking, on the spot turning and reverse motion. IEEE Robotics and Automation Letters, 2 (1), pp. 337–343, 2017, ISSN: 2377-3766. 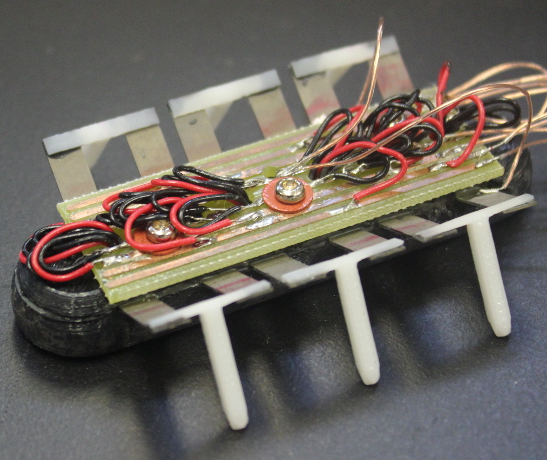 This article describes the design, manufacture, and performance of a prototype miniature resonant ambulatory robot that uses piezoelectric actuators to achieve locomotion. Each leg is comprised of two piezoelectric bimorph benders, joined at the tip by a flexure and end effector. Combinations of amplitude and phase can be used to produce a wide range of motions including swinging and lifting. A lumped mass model previously developed is described as a design tool to tune the resonance modes of the end effector. The completed robot was driven with frequencies up to 500 Hz resulting in a maximum forward velocity of approximately 520 mm/s at 350 Hz. 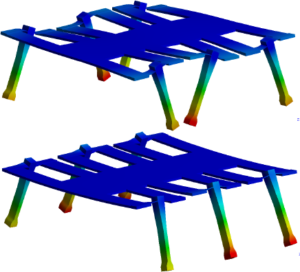 A frequency analysis was also performed to determine the effects of ground contact on the performance of the robot. This analysis showed a significant reduction in the resonance gain and frequency. IEEE Advanced Intelligent Mechatronics, Banff, Canada, 2016.
each other. The leg end-effectors of the robot were milled out of aluminium and a previously described lumped mass model was used to design the end-effector for the leg such that the swinging and lifting resonant modes were closely matched. The finished robot attained a swinging and lifting resonance frequency of 300 Hz and 330 Hz with a 5 Hz and 7 Hz spread between legs respectively. IEEE/ASME Transactions on Mechatronics, 21 (1), pp. 51-54, 2016. This article describes the design of a charge drive for reducing the hysteresis exhibited by a piezoelectric bimorph bender. Existing charge drive circuits cannot be directly applied to bimorph benders since they share a common electrode. 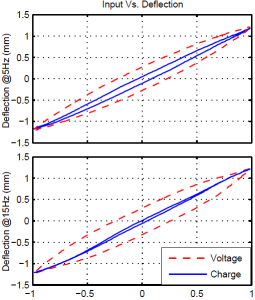 In this article a new charge drive circuit and electrical configuration is implemented that allows commonly available piezoelectric bimorphs to be linearized. This circuit consists of four major components, including, a high voltage amplifier, a differential amplifier, a piezoelectric load and a PI feedback controller. An isolation amplifier was used to achieve a differential amplifier with a high common-mode rejection ratio. The charge drive was tested by driving a series poled, three layer bimorph bender. The results demonstrate that the use of a charge drive can reduce the hysteresis from 26.8% to 2.1%. This work has identified an alternative feedforward method to improve the AC hysteresis performance of a piezoelectric bender by using a charge drive. IEEE Advanced Intelligent Mechatronics, Busan, Korea, 2015.